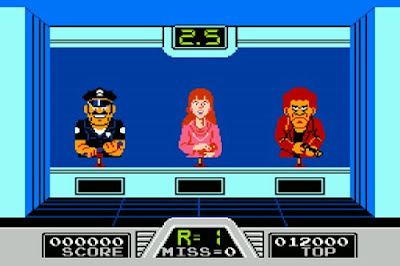 A random bit of nothing that I stumbled upon: The old Nintendo game Hogan’s Alley — which had players wielding the Zapper light gun to shoot cardboard cutouts of criminals and not shoot those of innocent bystanders — got its name from an actual FBI training facility. There currently is a Hogan’s Alley at the FBI academy in Quantico, Virginia, that didn’t exist until 1987, three years after Nintendo released the video game Hogan’s Alley in Japan. (The game came out in the United States the following year. Some may remember it as the game they played with the Zapper when they tired of Duck Hunt.) According to Wikipedia, the game probably took its name from an earlier training facility at Camp Perry. The term Hogan’s Alley can actually refer to any facility that specializes in training people in tactical shooting, it turns out, and that term was spawned by the first-ever newspaper comic Hogan’s Alley, which gave us the character The Yellow Kid and in which the title location was a crime-ridden slum.